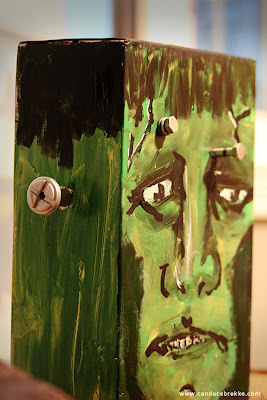 A R T & D E S I G N b y c a n d a c e b r e k k e : Turn An Old Shoebox Into Something Spooktacular! Here's a quick little project the kids and I worked on this weekend. Each child painted one side while mommy painted the front. 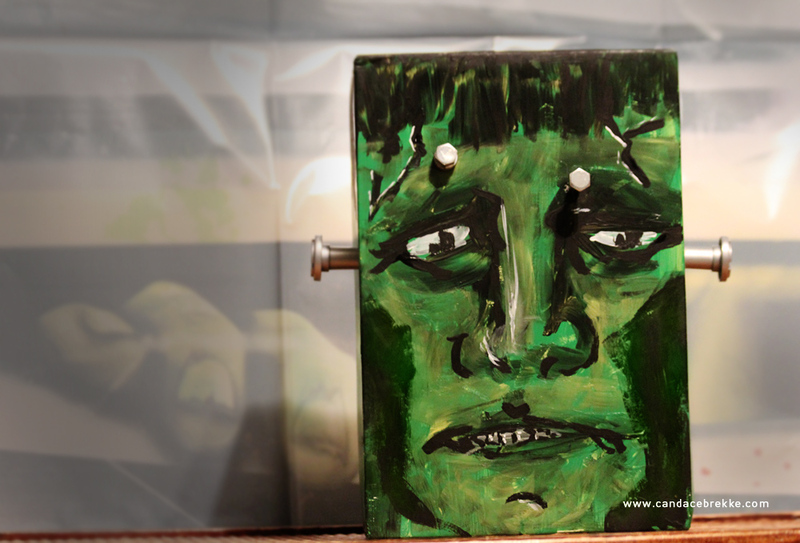 While our Frankenstein is a little scary, mommy thinks he looks a little more 'dazed and confused' than anything! Ha ha. It was fun to paint something different, though. As an added touch, we placed some real bolts in his forehead and put some plastic toy bolts on the sides. This is a simple project that didn't take a lot of time. You can get as detailed as you want, or simply paint it solid green and glue on some cardboard eyes, nose and mouth. We all know old Frank is a little square, so using up old shoe boxes is a great way to create your spooktacular craft!